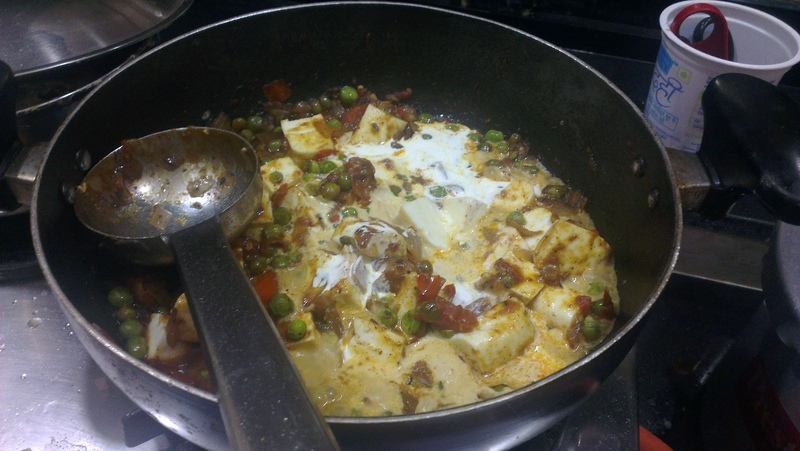 Mutter Paneer is a very versatile dish. Something about the combination of fresh cottage cheese and bright green peas makes for an enticing crowd pleaser, hence this an oft-repeated dish at our home. It is well loved among my family and friends and disappears quickly everytime it is served. 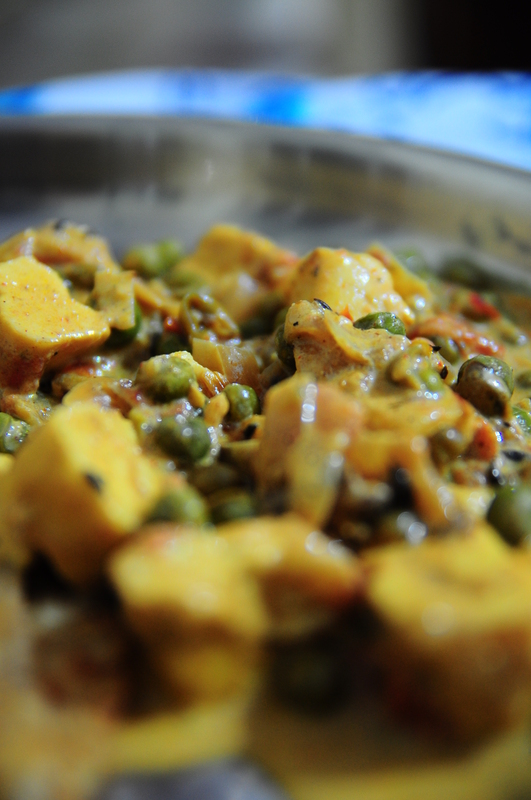 This curry can make a tasty pairing with either plain rice, jeera rice, naan, roti / chapathis ; the list is endless. Each home has its own version of this curry to suit their taste buds – I myself have tried 2 or 3 different recipes with great results.This also makes for excellent lunch box food. DH prefers to take this to office for lunch. This curry keeps well in the fridge and tastes even better the next morning after the spices have had enough time to rest and work their magic into the cream gravy and cottage cheese (yum 🙂 ). 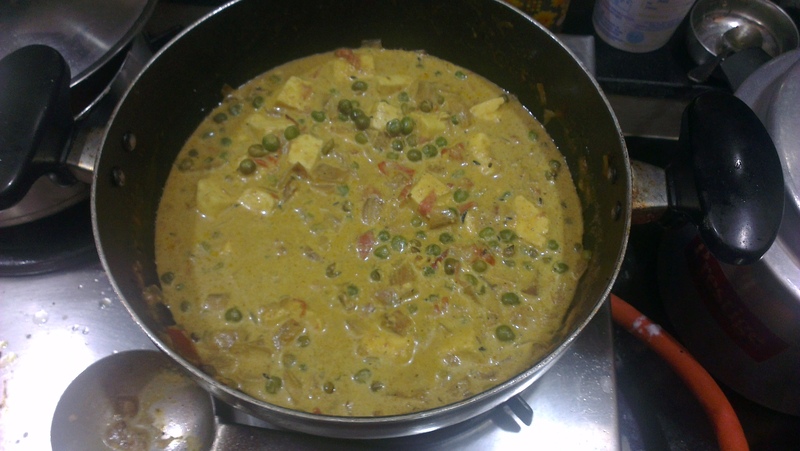 Here is one such recipe for making Creamy Mutter Paneer – in under 20 minutes. This quantity of curry serves 4 people. The addition of fresh ginger and fresh ground garam masala imparts a distinct and robust flavour to this curry. There is absolutely no compromise on taste although the cooking time is significantly shorter than in the traditional route. Read on to find out ! Roast all the spices together in a wide bottomed pan or tava for about a minute on medium flame, taking care not to burn them. The roasting will release the aromas of the spices. 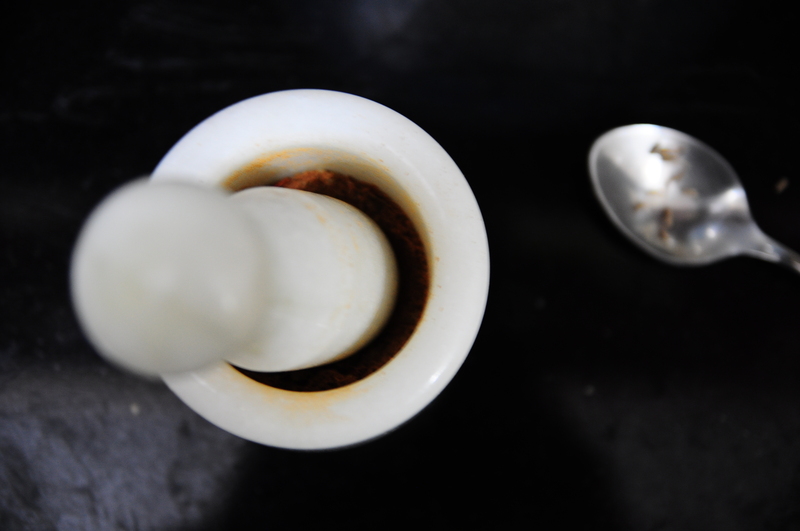 Switch off the stove, let it cool for a few seconds and grind them into a powder using a spice grinder (if you have one) or mortar and pestle (like I did). Once this is done, transfer into a cup and close with a lid so that the wonderful aromas are not lost before you get to the point of using them. This is your fresh ground Garam Masala. Heat some oil in a wide bottomed pan and temper it with Jeera and Hing. 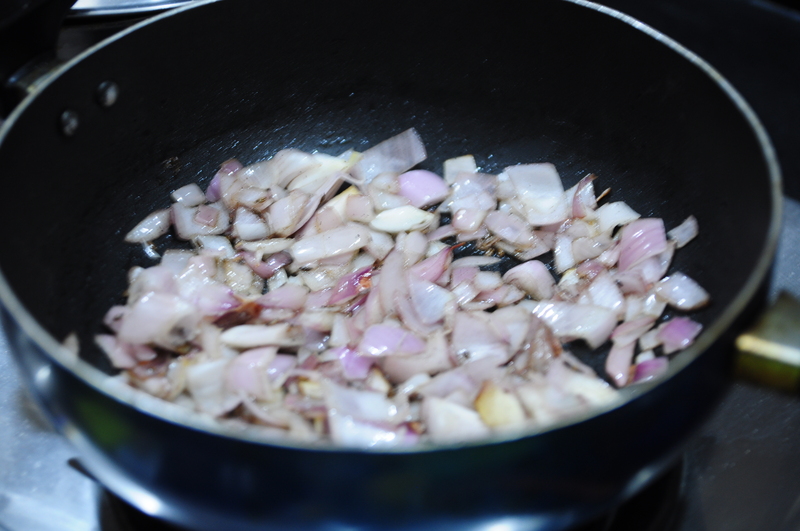 Once the jeer has spluttered, add the chopped onions and sauté until the onions turn soft and translucent. Add the chopped ginger and saute until the raw smell of ginger is gone (takes about a minute). 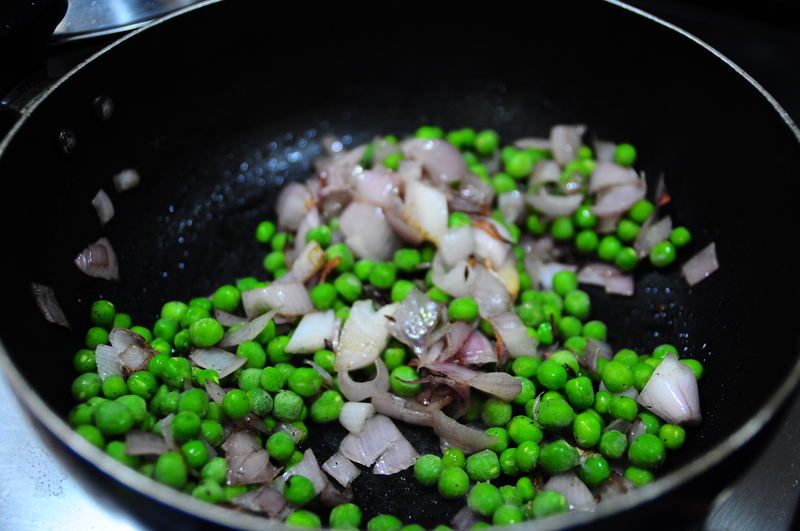 Add the fresh green peas and some water to this mixture, close the pan with a lid and let simmer for 3-5 mins checking occasionally for the peas to be done. 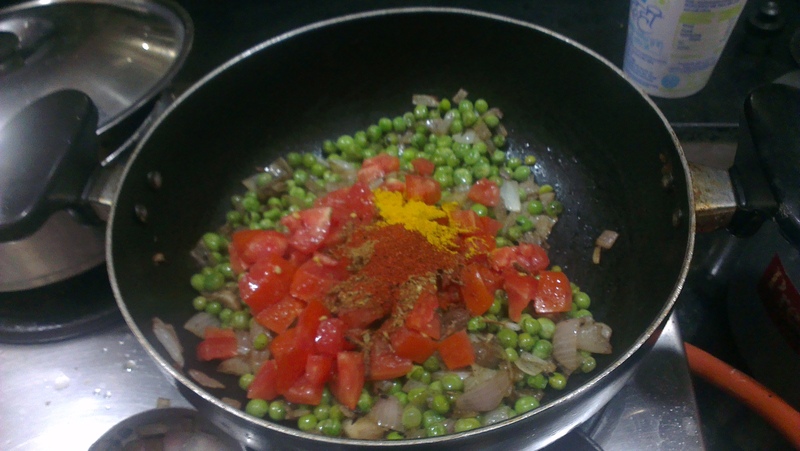 Once the peas are soft, add chopped tomatoes, chilli powder, turmeric powder, garam masala, sugar and salt to the pan and mix well. Add a little water to keep the spices from sticking to the bottom of the pan and burning. Let this cook for 5-7 mins on a low flame until the water evaporates and the mixture starts to ooze oil from the sides. 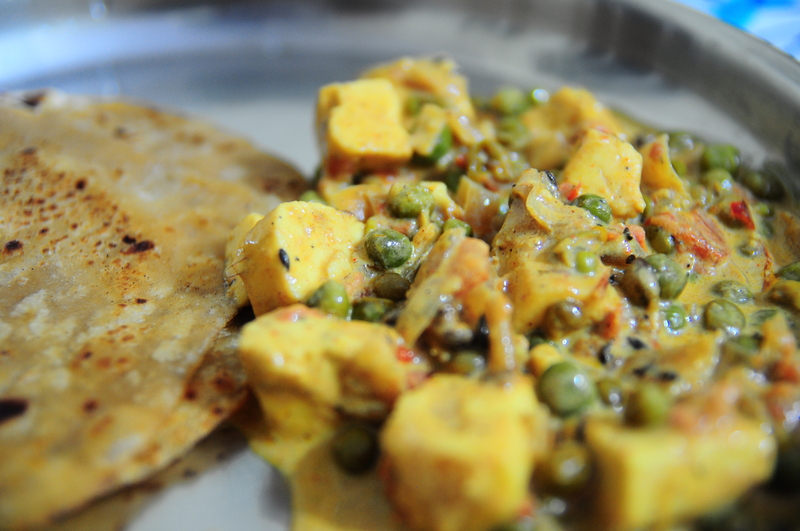 Add the cubed paneer to this and mix well, taking care not to crumble the paneer. Add fresh cream, milk and mix well. Make sure the flame is turned to low, so that the cream does not split. Add water and adjust the consistency of the gravy as required. Taste and adjust for salt and sugar accordingly. The Garam masala powder can be made in advance and stored in an airtight container. I prefer making it fresh in small quantities so that the pungency of spices is not lost over time. The addition of tomato puree and onion paste to this instead of chopped tomatoes & onions will result in a bright orange-red gravy, with a difference in taste. You could add a dash of lemon juice at the end and give it a mix, to give a nice flavour balance to the gravy. You can replace the cream with skimmed milk to make the gravy healthier. 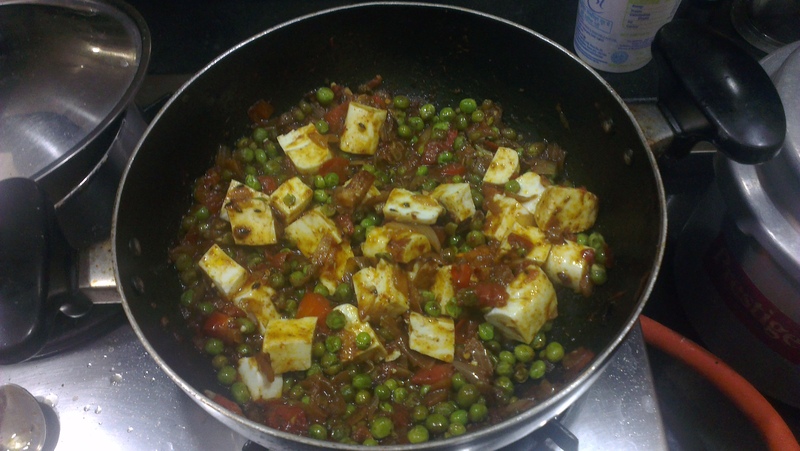 Using frozen peas makes the cooking process quicker, you can add them in with the paneer and they will cook up in no time at all. Also, they tend to retain their bright green colour. Do try this recipe and let me know how it turns out – I’m sure you will love it !! This looks absolutely yummy. My boyfriend loves curry so much. I think I will try to make this recipe for him as a little treat. Thank you!